The practice of Aakash mudra helps you to reunite with the collective consciousness. This mudra can also be called as mudra for enlightenment. This mudra is very easy to do.Just join the tip of the middle finger to the tip of the thumb finger. Here is the youtube video how to do Aakash mudrā and its health benefits. Aakash mudrā increases space in the body.Which gives various benefits to health and spiritual enlightenment.The practice of this mudra enables the person(atman) to reunite with the collective consciousness(Paramaatmaa or God). Negative emotions like fear, anger, sorrow, etc. are replaced by positive feelings and thoughts. The increase as mentioned above in internal space is affected by the elimination of metabolic wastes from the body. Aakash mudra detoxified the body.The increased internal space enables the rest of the four bodily elements: earthVayu(air), Agni(fire), Jal(water) and PritEarth) to increase, affording them a room to act. 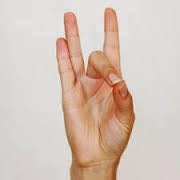 Thus, Aakash-vardhak mudra can be beneficially combined with mudras that increase the other four elements(i.e., Vaayu-vardhak mudra, Prithvi vardhak mudra, Agni-vardhak mudra and jal-vardhak mudra). In general, Aakash mudra is an excellent mudra that stimulates noble thoughts and helps the practitioner to take rapid strides along the path to moksha(salvation). It also helps a person who wishes to scale great heights in the art of meditation. The element Aakash is also a component of bodily humor Vata. Therefore, Aakash-vardhak mudra reinforces the Vata humor of the body. It should be done in moderation by people of Vata constitution. develop intuition and extra sensory powers. Detoxify the body by the elimination of metabolic wastes. Helps to overcome a feeling of fullness/heaviness in the body or body parts. To overcome discomfort caused by over-eating. To relieve congestion (and pain) in the head (due to a migraine or sinusitis). Irregular heartbeats, angina pectoris, etc. Daily practice of 30 minutes is enough to get good results.You can perform it at any time or any posture, but early hours of the morning and in meditation will give best and quick results. If you are a Vata dosha person, you have to perform it moderately only.